Looking for the perfect location to receive facials and peels? We have you covered for all of your facial needs at our flagship Silver Mirror location on the Upper East Side (UES). Our facial bar provides the latest rejuvenating treatments that will help you look and feel completely refreshed. Discover the luxurious atmosphere and convenient treatments that make Silver Mirror a prime Upper East Side destination for skincare. Our flagship location proudly serves the Central Park East, Upper East Side, Midtown East, Roosevelt Island, Long Island City, Murray Hill and Midtown neighborhoods in New York with our top skincare treatments. Book your treatment at our main location today by calling or using our helpful online form. All the treatments that made Silver Mirror famous across New York City are here on the Upper East Side. Our facial bar includes the latest techniques used for top quality peels and facials. Many of these services can be completed in either 30 or 50-minute facial treatments. Our facial treatments on the UES are some of the most advanced that you will find in Manhattan These facials include treatments that target specific skin care issues, such as dry skin, sensitive skin, and skin that’s showing the signs of aging. We have treatments that are designed to fit the needs of women, but we also provide men’s facial treatments. Peels are another service that we offer with many options. Our peels can treat skin at a deep level to eliminate acne or to refine your skin. Our Antioxidant Peels add vital nutrients to your skin. Acne can be targeted directly with several of our peel treatments, including our more intensive chemical peels, such as the Acne Clarifying Peel. All of our facial treatments can receive customizable add-on enhancements to give you a more personalized experience. Dermplaning, LED therapies, extra extractions and neck care enhancements are all part of our services on the Upper East Side. 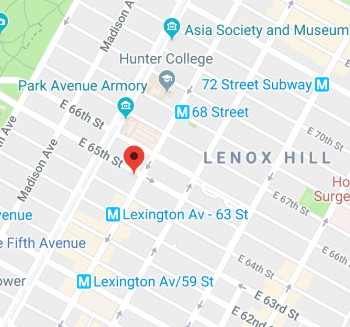 Looking for our UES location on foot? Here’s how to find us. Our Upper East Side facial bar location is found a location between 64th and 65th St. Turn onto E 65th from Park Avenue to find Silver Mirror at the end of the street, right before it hits the crossing onto Lexington. If you turn onto Lexington Street from E 65th, you’ll find Silver Mirror immediately on your right. The Lexington Ave / 63rd St subway station featuring the F and Q subway trains is only two blocks away from our UES facial bar. Simply walk north on Lexington as you exit the station and you’ll find Silver Mirror on your left shortly after. Simply walk north on Lexington as you exit the Lexington Ave / 59th St subway station featuring the 4, 5, 6, N, R and W subway trains and you’ll soon find Silver Mirror only five blocks away from the station. Start enjoying the rejuvenating feeling of our facial treatments by booking your appointment today. If you have any other questions about our services, receive the answers you need by placing a call directly to our booking team using the number at the top of the page. We are currently accepting new clients, so please sign up using our online form to book your appointments.